When it comes to businesswear, we understand that you can grow tired of wearing the same ensemble every time. Here at Jeetly, we strive to provide our petite ladies with the best and brightest businesswear tailored to the petite frame to ensure that you always feel fabulous when conquering the business world. 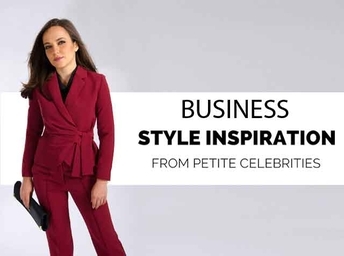 When we think about styling ourselves for a successful day at work, what better way to get some serious style inspiration that to turn to some of the most successful women in the celebrity spotlight? We’ve turned our attention to our more famous petite sisters to inspire ourselves when putting together our Jeetly outfits. Take a look at how our successful petites are doing it in the limelight! British television presenter Lorraine Kelly is only 5ft 4 but she always makes a huge style statement whenever she’s on our screens! A wonderfully successful woman, Lorraine has seen success in the entertainment business as well as cultivating a career in journalism. We love Lorraine’s bright style and think she’d love our collection of petite dresses from Jeetly! Respected worldwide, Emma Watson is another 5ft 4 petite with enormous ambition. A hugely successful actress and women’s rights activist, Emma is always dressed to impress and show that she means business. We love a strong suit jacket here at Jeetly, and think Emma would be right at home in one of our tailored petite suits. The ultimate celebrity style icon! When she’s not wowing us with her latest creations, 5ft 3 petite superstar Victoria Beckham is impressing us with her stunning fashion sense. Victoria has the perfect figure for some beautifully tailored trousers, so we bet she’d love our selection of petite trousers from Jeetly. As one of our tiniest petite celebrities, Nicole Richie arguably has the biggest personality! When it comes to her business, Nicole isn’t afraid to speak her mind and get things done. While juggling so many roles in and out of the spotlight, we think that Nicole could benefit from a versatile and tailored petite jacket so she can show off her petite frame whatever the occasion! Who’s your celebrity style inspiration? Browse our full petite clothing range to find your latest petite businesswear look.